My dad used to always tell me that the virtues in keeping things simple, easy and small was so huge, that it gets often missed. His knack for keeping things real simple and constantly seek beyond what seemed obvious or what were ‘mainstream voices’, got him untold riches. Relationships. Ideas. Discoveries. And a wide spectrum of people who wanted to work with him. The essence of it was all about having an abundance of curiosity and an attitude of discovery. More of dad later. When Vivek Patwardhan recommends a book, I close my eyes and buy it. Thats that. 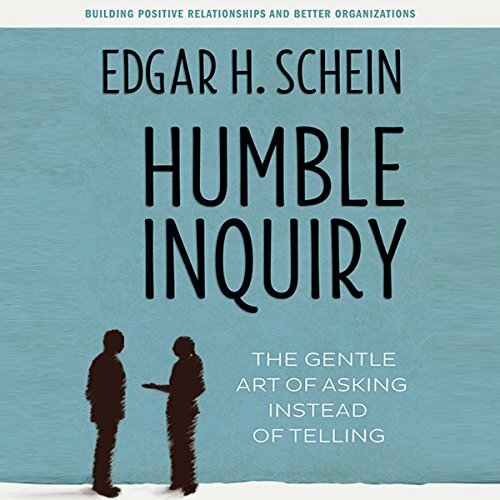 When he recommended “Humble Inquiry” by Edgar Schein, it was no different. Having consumed several of Edgar Schein‘s work in the past (and occasionally foisting it on MBA students who I taught), I was mildly surprised that I hadn’t come across this work before. That it was dated June 2013, was some consolation! Schein writes at the end of the book, “This book represents a culmination and distillation of my 50 years of work as a social and organisational psychologist“. That one comment should be suffice to get anyone get started. But there is more. Here is another quote. “The current book Humble Inquiry brings together all of these trends in showing how culture and individual behaviour interact, and what it will take in the way of counterculture behaviour to deal with the changes that are happening in the world“. In more than one way, the last few posts of mine have been about changes that are occurring in the world and our ways of dealing with them. Be it facilitation, Working Out Loud or even ‘Social’ for that matter. This book settles that theme remarkably well for me. My own stumbling across such themes is either a fortuitous consequence or perhaps I am viewing everything that I am stumbling across with my current lens. From very early on, Schein anchors his argument as an alternative to the popular mainstream culture of ‘tell’. “We also live in a structured society in which building relationships is not as important as task accomplishment in which it is appropriate and expected that the subordinate does more asking that telling, while the boss does more telling that asking. Having to ask is a sign of weakness or ignorance, so we avoid it as much as possible”. He drops anchor on curiosity, to explore and a willingness to ask questions to which we do not already know the answer. The book is insightful in more ways than one. It is a read that I would recommend to any leader aspiring to lead large organisations now. And more importantly, in the future. The examples are lucid and pointed. Before you assume that the book is a set of skills about asking questions, let me hasten to add, that it is far from that. In fact, Schein himself states explicitly at several places. “The kind of inquiry I am talking about derives from an attitude of interest and curiosity“. The book has several parts to it, stretching from building a case for it, articulating what it is and what could be possible inhibitors and ideas about developing this attitude. The weaving in of Humble Inquiry through the windows of simple frameworks like Johari Window and the ORJI (Observation – Reaction – Judgement – Intervention ) model helps in making it contextual and practical. Its an easy, simple read. Devoid of jargon. Its the best Rs.123/- that I have spent in a long time! This book is a superlative, if you are in the talent development, culture change arena. If you are an executive coach or are in pursuit of perfecting your skills, this could well be the centrepiece of your practice. Of course, this book holds a bundle of benefits for anyone serious about leading teams in our current times! The scepter of uncertainty envelopes every leader’s ornamental bauble. Knowledge and expertise are far too distributed within and outside the precincts of the firewall. The ‘attitude’ of ‘Humlbe Inquiry”, when coated with ‘social skills’ adds another rather potent dimension to the modern day leader’s quiver. And, dad. It was while reading this book that realisation dawned that what endeared him to many was his consummate practicing of ‘Humble Inquiry’. His innate ability to ask a question with warmth, genuine interest and wait for answers used to have many wanting to talk to him. This book reminded me of him. Thats one more reason that this book stays on my mind. Pingback: Stories and culture Building Bridges Breaking Walls One Story at a time.